Happy Spring 2019 KPY Families! 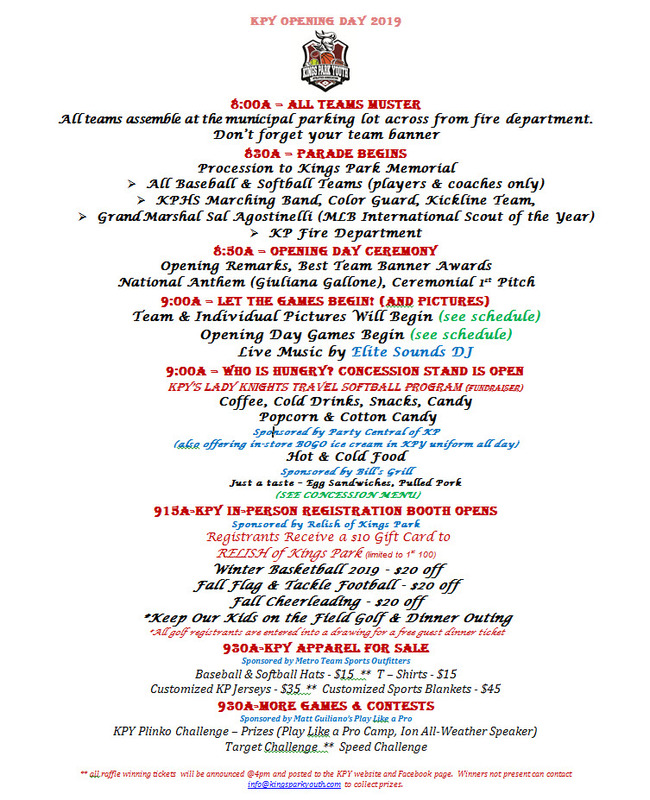 KPY’s Baseball & Softball Opening Day, Parade and Celebration at Kings Park Memorial is this Saturday beginning at 8:30am (Parade down Main Street). Opening Day games begin after 9:00am. We hope to see many of you cheering on our nearly 500 baseball & softball players at the parade and opening day games. See the below itinerary for what’s going on. DON’T miss Opening Day in-person discounted registration for Football, Basketball Cheer and the Golf outing. The 1st 100 will also receive a $10 gift card to Relish! Baseball & Softball families will receive another communication from the Commissioners. Please click on our sponsors below.